Holla! So I have had my eye on a certain entry rug for a while now, but knowing how rough my family is on entry rugs I just couldn’t see spending $50 on a doormat. So on a serious whim yesterday while out shopping for supplies for #ProjectLittleMiss we picked up a new plain doormat. With no intentions to do anything to it we got home & I thought… I could totally make that rug. No less than 10 minutes later I had recreated the rug (almost to a T) for a grand total of $10 & some change. If you were doing this with contact paper I would recommend printing out your text on an 8.5″x11″ sheet of paper & laying it on top of the contact paper. From there you can use your blade to cut out your design. Again, a little more effort, but so worth it I think! 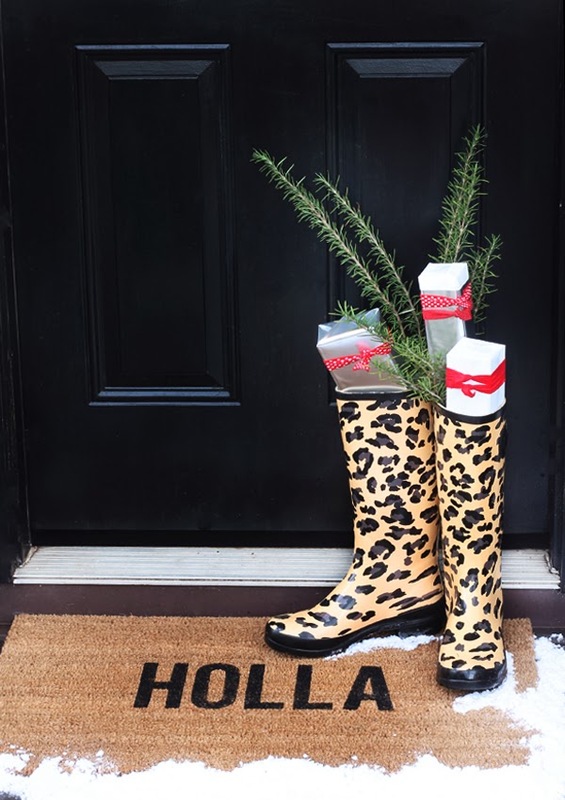 How fun would this be welcoming your holiday guests or even as a unique gift for those hard to shop for friends in your life?! Trust me, we haven’t had any extra time for other projects thanks to #ProjectLittleLady, so if I could whip this out in ten minutes, so could you! This DIY is so much fun! 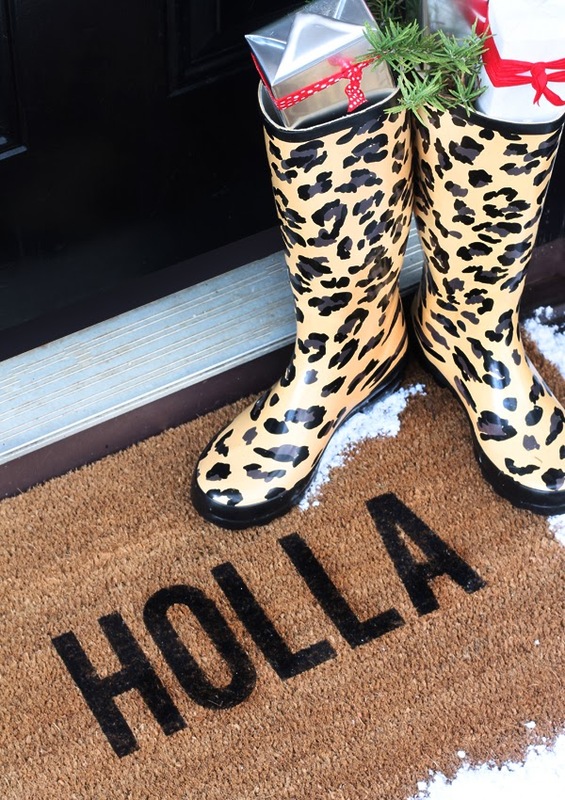 You could make your own doormats for the whole year-round! Great idea. This turned out so great! Definitely never would have guessed it was DIY. Another project to add to my list! 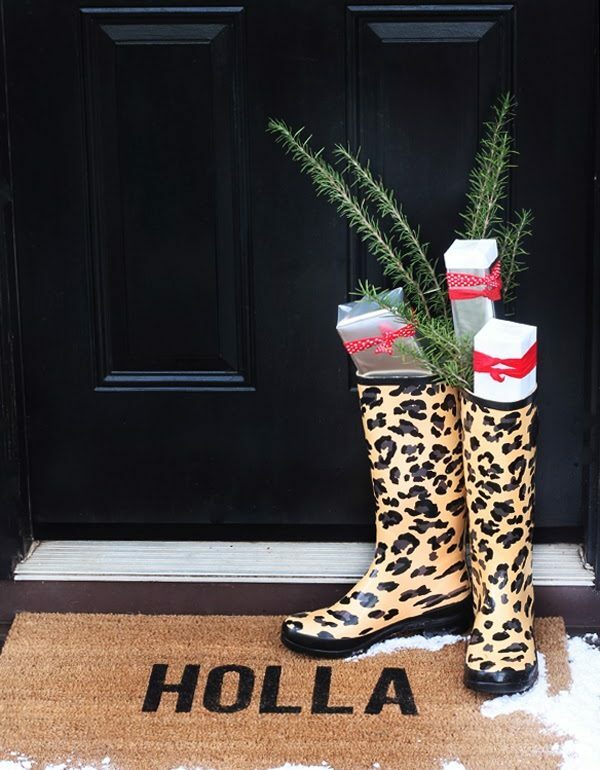 Love DIY doormats! Looks great! I love this. I need a doormat, I just might do this! I mean really, so cute!!!! I stenciled our monogram on our doormat early Spring, and it's holding like a champ! Soooo cute! Love it!! Holla!!!!! Oh my gosh!! I couldn't decide on a tree topper and a friend sent me your link on Pinterest. I'm so glad she did! I headed over to Hobby Lobby and picked up some wire edge ribbon and got to work with my wooden skewers! Check out my finished project! It definitely looks good and holds firmly when you have more skewers as they began to hold each other in place. I kept adding til I was happy with the fullness and because its individual pieces of ribbon it's so forgiving. Keep playing with it until you achieve the look you want! Thanks again!! I just love everything about the first photo! Such a cute doormat. Hi! Such a gorgeous room!! Would you mind sharing where you purchased your light fixture? I also love the little brass one in your kitchen. And do you have a tutorial for the built-ins? My dining room is very similar and I would love to do something like that. So happy I stumbled on your site!